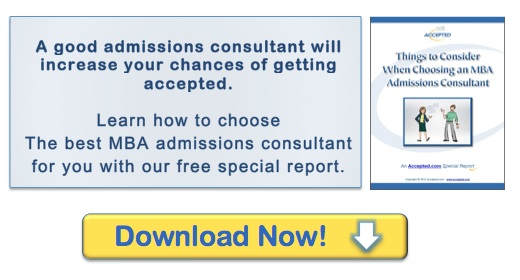 Why Use an MBA Admissions Consultant? I’m sure if you took a poll of business school admissions consultants, the overwhelming majority would have gotten in without the assistance of a consultant. Many also would not have taken a GMAT prep course before applying to b-school. However, over the last thirty years test preparation has gone from being an act of desperation, to a competitive edge, to a mainstay of the application process. Today, to maximize chances of a top score and acceptance at the best possible school, most applicants take a test prep course. The same phenomenon is occurring with admissions consulting, but educational advising is currently at the “competitive edge” stage. At this point, using a consultant is not crucial for some, but it is extremely helpful for all. The question is not whether one can get accepted to a top MBA program without a consultant. Many are accepted without professional advising. The question is: Are the advantages of using a consultant worth the cost? • Enable your acceptance to a “better” school. “Better” implies more professional opportunity, increased earnings, a network with more panache, and an educational experience more to your liking. Just looking at dollars and cents, “better” represents potentially tens of thousands of dollars more in your pocket during your career. • Help you snag a scholarship. Savings: tens of thousands of dollars. • Save you the cost of reapplication. Applying to b-school or any other graduate program including application fees and travel expenses can cost several thousand dollars. When you apply one time, you save. • Reduce the time, stress, and frustration you (and those close to you) experience during the admissions process. We can guide you so you don’t go down tangents and useless paths or flounder for weeks as you struggle to learn what we know. So can you gain acceptance to a top b-school without using an admissions consultant? Certainly. Should you try? Only if you don’t value the experience, objectivity, and skill that can provide you with returns many times the cost. This post is excerpted from the Accepted.com special report, Things to Consider when Choosing an MBA Admissions Consultant. To download the entire free special report, click here.